Join Us in Supporting #ChildrensHospitalWeek! To celebrate the amazing things being done at Children’s of Alabama, we’re inviting you to join us March 5-11 in celebrating #ChildrensHospitalsWeek! 1.Wear a Band-Aid. Show your support for Children’s of Alabama by wearing a Band-Aid of your choice, taking a photo, and sharing it with the #ChildrensHospitalsWeek hashtag. 2. Tune is to Children’s of Alabama’s Facebook Live Event at 12:30 pm CST on Wednesday, March 7. 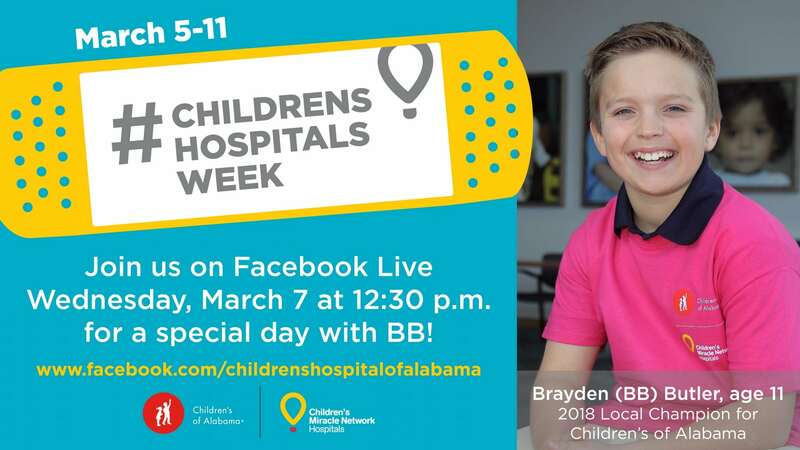 This live fundraiser, broadcast from Children’s of Alabama, will feature our 2018 Children’s of Alabama Children’s Miracle Network Hospitals’ Champion, Brayden “BB” Butler as he shares his amazing story along with his hospital care team. Watch live on Facebook HERE. 3. Donate. Help kids like BB continue to get the best care when they need it here at Children’s of Alabama! Give HERE. 4. Share! Help us spread the word about #ChildrensHospitalsWeek! Share the below suggested social media copy on your channels.